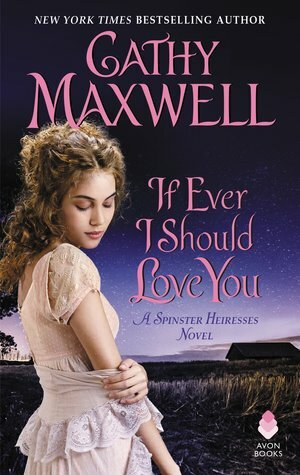 Aloha to Cathy Maxwell and IF EVER I SHOULD LOVE YOU - Release Day Celebration! 1. Leave a comment for your plans for New Year's Eve ... or New Year's Day! My family will be traveling home to Maryland on New Year's Eve ... I look forward to my cats! 2. Comments are open through Sunday, December 31, 10 pm in Baltimore. 3. I'll post the winner on Monday, January 1. On an expedition into Oregon's Lava River Cave, outdoor journalist Meg Reed stumbles across a body buried way more than six feet under . 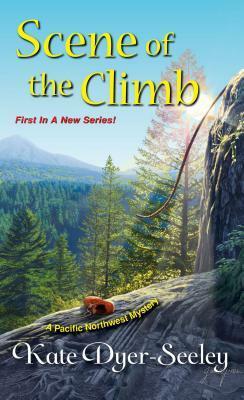 . .
A debate is raging over the use of public lands, and to cover the story for Northwest Extreme magazine, Meg joins a congressman and several others on a subterranean adventure--despite her intense claustrophobia. The thoughts of cave-ins and cougars are unnerving, but at least it's a distraction from her other anxieties, like her best friend's departure for Italy, her boss's plan to sell the company, and the ongoing questions about her father's suspicious death. But in the chilly darkness of the volcanic rock, she discovers a Forest Service employee, stabbed with a trowel. Now Meg will need to do some in-depth investigating or the truth may never come to the surface . 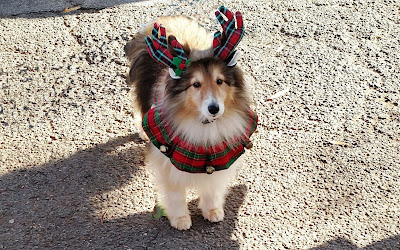 . .
Kate lives in the Pacific Northwest with her husband and son, where you can find her hitting the trail, at an artisan coffee shop, or at her favorite pub. Better yet—all three. 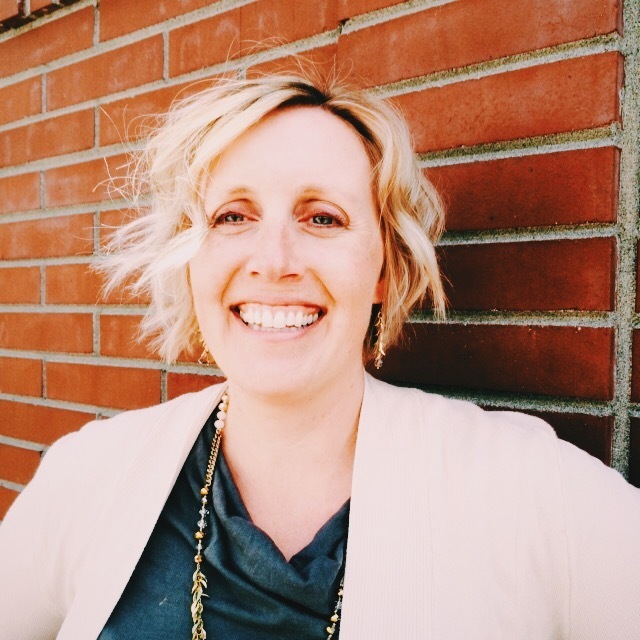 When Meg Reed graduated with a journalism degree, job prospects were slim pickings. She convinced the owner of Northwest Exposure, a high adventure magazine, that she could tackle each assignment with gusto. Yet each gig required her to face a personal fear. 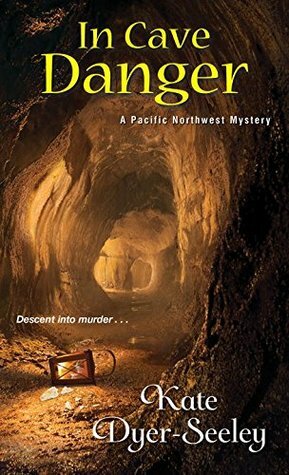 IN CAVE DANGER, Book 5 in the Pacific Northwest Mystery series, Meg signs up for a tour of a lava cave despite her fear of small spaces. Just as the tour descends into the tunnels, she stumbles across the dead body of a forest ranger. IN CAVE DANGER tackles the timely debate of public lands - should the land be preserved for posterity or opened for recreation? The murdered ranger was an outspoken advocate for preservation thus Meg suspects a local rancher of foul play. As she launches her own investigation of the ranger's death, she finds herself embroiled in a larger mystery that involves her father, a legendary journalist who was run down while investigating the meth trade. 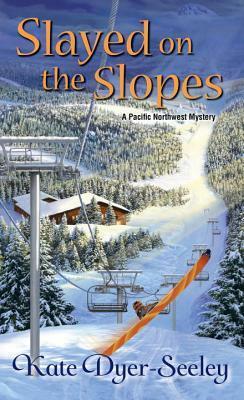 This larger mystery has been the overarching story line since SCENE OF THE CRIME, Book 1 in the series. I felt the meth trade overshadowed the "mystery of the week" thus shortchanging Meg's sleuthing around the lava cave and high desert. Yet Dyer Seeley was able to wrap up both mysteries in this series finale while staying true to Meg's character. IN CAVE DANGER followed previous books in detailing the great outdoors in the Pacific Northwest which fuels the high adventure industry. I enjoyed learning about the Lava River Cave and the Oregon High Desert - who knew Mother Nature was so creative? I also appreciated Seely Dyer including the emerging culture of Bend, Oregon, along the Deschutes River - what's not to love about fresh air, majestic scenery, and indie pubs? I purchased IN CAVE DANGER since I enjoyed previous books in the series. 1. Leave a comment about the Pacific Northwest - have you explored its natural resources? Or enjoyed it unique culture? During my first assignment in the Air Force, I often traveled from home outside Boston to Seattle to meet with the Boeing Company. I often stayed the weekend to soak up the local sights, including the Seattle Underground Tour (link). 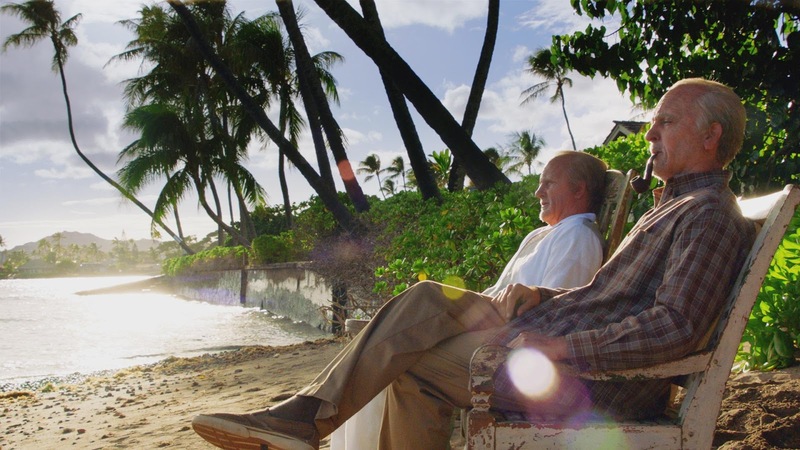 - spending his golden years with McGarrett; see image below with the actors transformed into senior citizens. This episode was predictable yet entertaining. It's Christmas Eve and Danny tells Charlie a bedtime story about a recent Five-0 case involving bad Santas and a holiday miracle. The title translates as "A Tall Tree Stands Above the Others". Let me amend that to read "Several Tall Trees Stand Above the Others". While Danny recovers from his gunshot wound, he and Charlie prepare for Santa's visit on Christmas Eve. As Danny tucks Charlie in bed, he shares a different kind of bed time story in which "angels" help the H5O team. Two villains, dressed as Santa bell ringers, blow up an armored truck for its cash deposits. 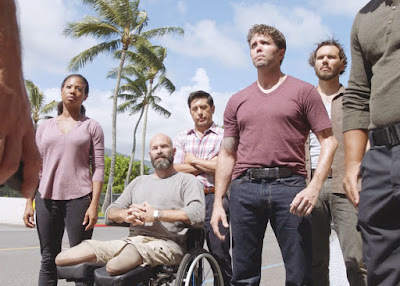 As the Santas escape into a local mall, the H5O team respond to the situation. Meanwhile, Junior is driving a group of Wounded Warriors to a holiday event when he hears the call. He responds accordingly with his "brothers in arm" in tow. Each Wounded Warrior offers a unique skill set to assist the team as they empty the mall and apprehend the bad Santas. This episode is now my favorite for the season. Watch both episodes on CBS.com. 1. Leave a comment about Christmas traditions - what is your favorite? H5O ends with Steve letting himself into Danny's house while Danny is tucking Charlie into bed. Steve then eats the cookies Danny baked for Santa. Classic Steve! Tomorrow, December 15, is National Ugly Sweater Day .... who makes up these holidays? Perhaps the producers of Bridget Jones' Diary. 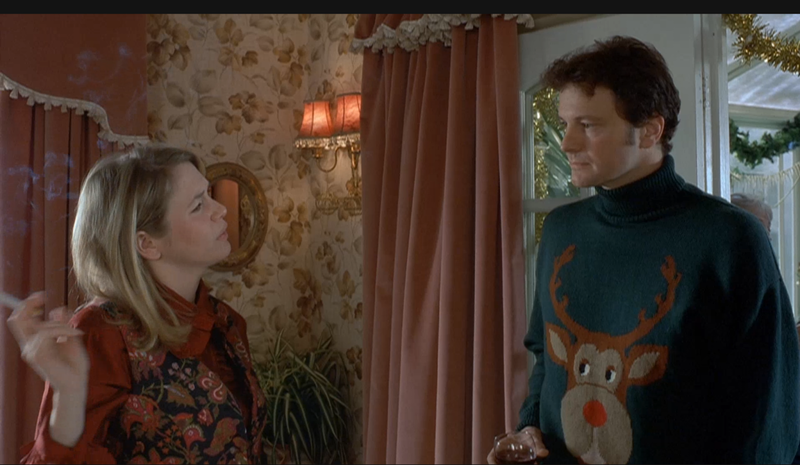 Early in the film, Bridget returns home for her mother's annual curry buffet only to meet a childhood friend, Mark Darcy, in an ugly sweater he received from his own mother. Then again, Bridget's own mother asked her to wear the ghastly "wallpaper" outfit. 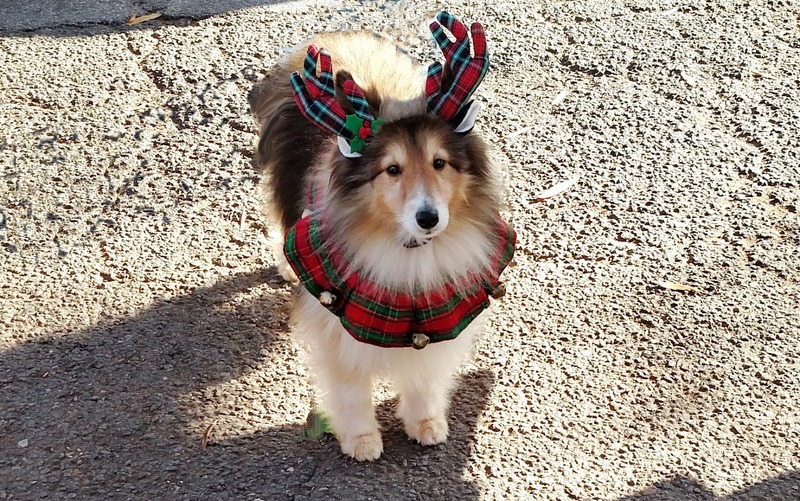 Take that ugly sweater out and wear it in public, chances are, you won’t be the only one wearing the Rudolph sweater grandma made for you ten years ago. Don’t have an ugly sweater? Make one of your own. Bedazzle an old or thrifted sweater, add embroidered holiday motifs and some sequins, and voila, you are ready for Ugly Sweater Day. Host an ugly sweater party. 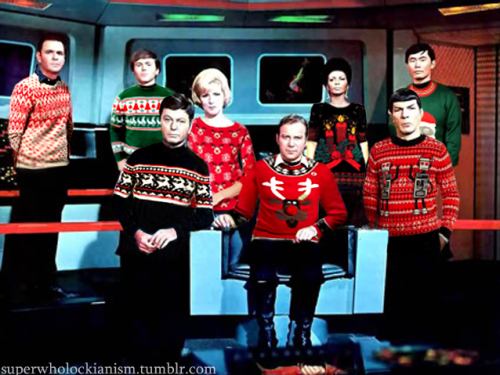 Have your guests contribute to charity and hold an ugly sweater competition. The person flaunting the ugliest sweater goes home with the top prize. Let's get in a festive mood - tell me about your holiday traditions, including those that are religious, secular, or wacky. One randomly selected commenter wins a swag pack. Comments are open through Sunday, December 31, 2017, 10 pm in Baltimore. I'll post the winner on Monday, January 1, 2018. Today is the 76th Anniversary of the "date which will live in infamy". The Japanese targeted numerous military sites on the island of Oahu, including Pearl Harbor, Hickam Field, Barbers Point, and Kaneohe Bay. As most of you know, I lived on Joint Base Pearl Harbor Hickam from 2009-2013. It was an unique opportunity to pay tribute each year to the military and civilians who responded valiantly to the surprise attack. 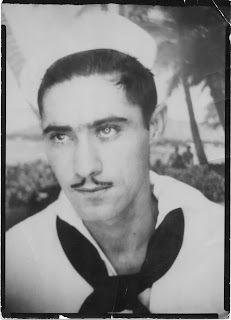 After meeting romance author Pamela Clare (link) in 2010, I learned her Uncle Joe was aboard the USS Utah, a training ship, when it sunk on December 7, 1941. In 2011, she published BREAKING POINT, Book 5 in her I Team series ... and she asked me to review it. At first I was hesitant; Romantic Suspense is not my preferred genre. 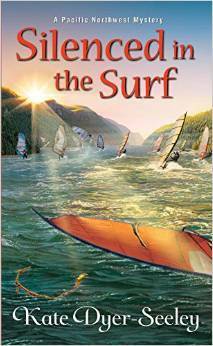 However, I loved this book ... and I read portions of it to Uncle Joe as I sat on the deck overlooking the USS Utah. I think he loved the book, too. I was reminded of the power of romantic fiction last night when a reader friend told me she'd been inspired by BREAKING POINT (I-Team #5) to become a nurse so she could work with people suffering from PTSD. Zach, the hero of that novel, had PTSD from combat experience as a SEAL in Afghanistan. My reader announced has completed her nurse's training and now has a job helping people like Zach. In honor of Danielle's fantastic achievement, here's an excerpt from BREAKING POINT. Check out her Facebook page for the excerpt at this link. I thank Pamela for posting this tribute to her reader ... and her reader for serving our veterans. 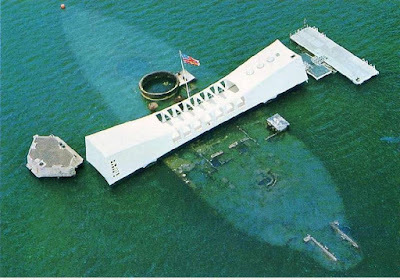 As we take time to remember Pearl Harbor (and the other sites on Oahu), let us live a life that honors their sacrifices. 1. 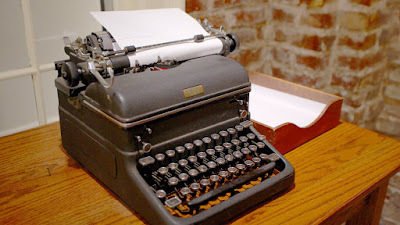 Leave a comment about WWII - do you have a favorite book (any genre), TV show, or movie from this time period? My father, a Korean Era Army veteran, loved HOGAN'S HEROES. 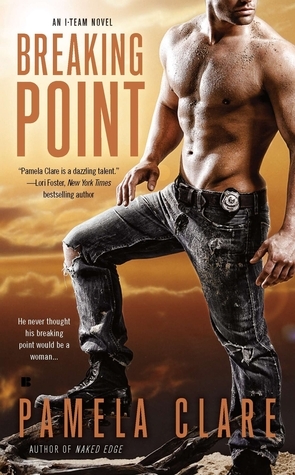 Check out my review of BREAKING POINT at this link. Check out a guest post from Pamela about Uncle Jo at this link. When Lucy Berberian quits her Philadelphia law firm and heads home to Ocean Crest, she knows what she's getting--the scent of funnel cake, the sight of the wooden roller coaster, and the tastes of her family's Mediterranean restaurant. But murder wasn't on the menu . . .
She could do without Heather Banks, though. The Gucci-toting ex-cheerleader is still as nasty as she was back in high school . . . and unfortunately, she's just taken over as the local health inspector. Just minutes after eating at the Kebab Kitchen--where she's tallied up a whole list of bogus violations--she falls down dead in the street. Word on the grapevine is it's homicide, and Lucy's the number one suspect . 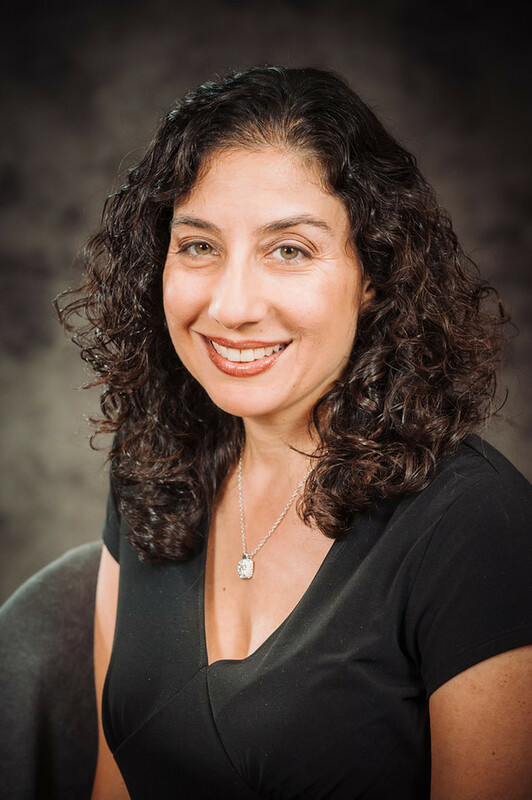 . .
After college, Tina worked as a NJ Deputy Attorney General, a patent attorney, and a mechanical engineer. Her love of reading fiction for pleasure helped her get through years of academia. Her law cases inspired an inquiring mind of crime, and since then, Tina has been hooked on mysteries. Tina still lives in New Jersey with her supportive husband and two young daughters. Please visit tinakashian.com and join her Newsletter to enter free contests to win books, get delicious recipes, and to learn when her books will be released. The emotive power of hummus all over the Middle East cannot be overstated, being the focus of some serious tribal rivalries. Rivalry prompts patent attorney Lucy Berberian to quit her job in Philadelphia and return home to her multicultural family in Ocean Crest, New Jersey. 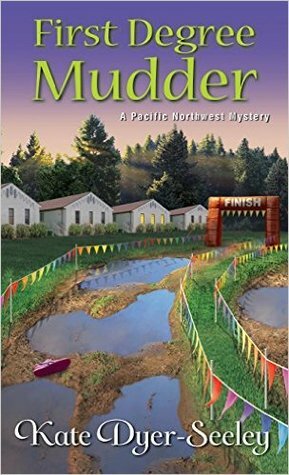 Rivalry rears its ugly head again when Lucy argues with Heather Banks, a high school mean girl turned corrupt town health inspector. Just as Lucy sets out to protect her family's restaurant from further violations, Heather is poisoned after eating at the Kebab Kitchen's new hummus bar. Lucy becomes the prime suspect and the restaurant looses customers, jeopardizing her parents' retirement plans. Alas, Lucy sets out to solve the mystery with help from her family, friends, and even a mobster. Kashian draws upon her own experience of the Jersey shore to deliver a cozy mystery with a touch of nostalgia for the boardwalk. Kashian molds Lucy into a flawed, but lovable, heroine. While Lucy may be an educated lawyer, she is not quite the slealthy detective, leading to predictable hijinks as she steps on a few toes. But Kashian excels with her diverse cast of characters, celebrating the unique heritage of the immigrants who built our country ... and made delicious food! Kashian, like Lucy, is embarking on a new career. 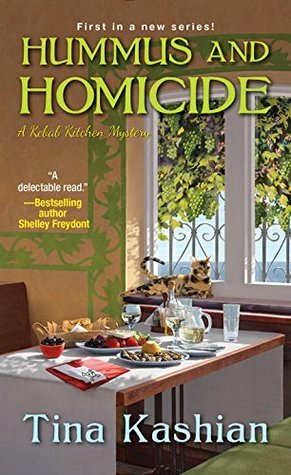 As a seasoned romance writer (Tina Gabrielle, link), Kashian takes on cozy mysteries like a pro. I look forward to reading more from the Kebab Kitchen! I received an Advance Review Copy (ARC) from Kensington to review. 1. Where is your favorite beach? What is your favorite beach food? What is your favorite beach activity? Outside of Hawaii, I enjoy walking on Clearwater Beach and collecting sea shells. I indulge in ice cream to beat the heat! 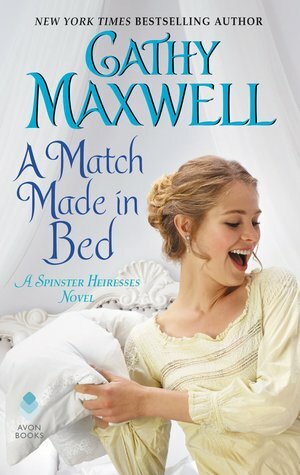 - Molly, Danielle D., Mary, and Jane wins swag plus a leather Scottish castle bookmark! 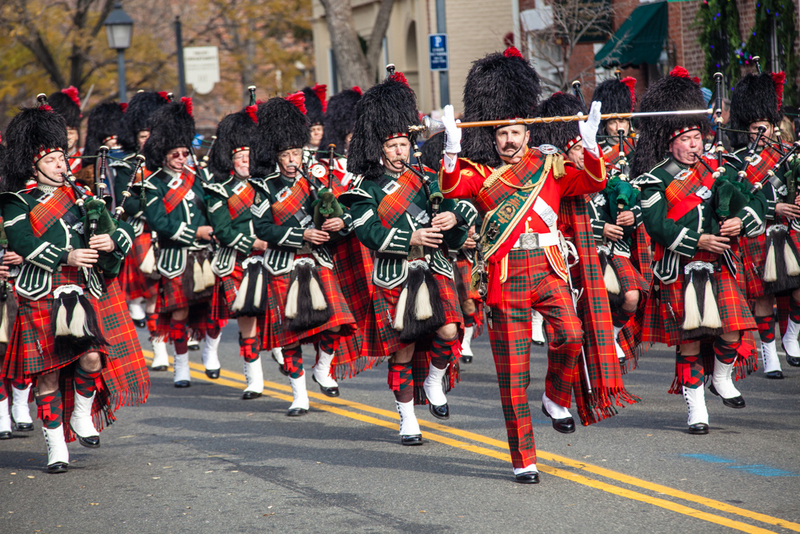 For the 47th consecutive year, we proudly present The Campagna Center's Scottish Christmas Walk Parade. 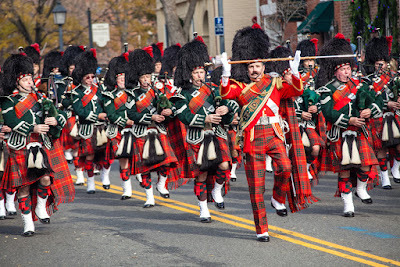 Enjoy marching units filled with the magnificent tartans of Scottish Clans, the stirring sound of Scottish bagpipes and drums, Scottish dancers, reenactment groups, Scottie dogs, dignitaries, classic cars, Santa Claus, and much more. The parade begins at St. Asaph and Wolfe Streets and concludes at Market Square with a massed band concert. The parade will take place rain or shine. How about you - any plans for the weekend? I am giving away swag to four randomly selected commenters to the posts in December. Comments are open through Sunday, December 31, 10 pm in Baltimore. I'll post the winner on Monday, January 1.